A screaming audience listens to a performance by Of Monsters and Men on the Coachella Stage on the first night of Weekend 1. Band members Brynjar Leifsson, left, and Nanna Bryndís Hilmarsdóttir of the Icelandic group Of Monsters and Men take in some sun at the Republic Records Coachella party in La Quinta. Mr. Leifsson, the band’s lead guitarist, keeps a small photo of the first crew member from the band’s first tour in his wallet as a keepsake. ‘It’s special because we’re close friends,’ Mr. Leifsson says. English guitarist and songwriter James Bay got his ring when he was 19 at the Cambridge Folk Festival. Ms. Khan purchased the locket in Los Angeles two years ago and wears it as a good-luck charm. ‘I think there’s something to be said about sharing your life with someone,’ Ms. Khan says. American guitarist Gary Clark Jr. always carries a small, black Bic lighter in his pocket. ‘It’s like a superstitious thing,’ he says. ‘I’ve got to have my picks in my right pocket, a lighter in my left…otherwise it throws my whole thing off,’ Mr. Clark says. Cold War Kids performs on the Outdoor Stage on Sunday. Australian singer-songwriter Courtney Barnett got her hat for Coachella at a thrift store in Pomona, Calif.
Misty Boyce performed on keyboard and vocals with BØRNS on the Mojave Stage at Coachella. She brings a trucker hat with her on tour. 'It’s my little security blanket. I feel like I'm protected somehow,' says Ms. Boyce. 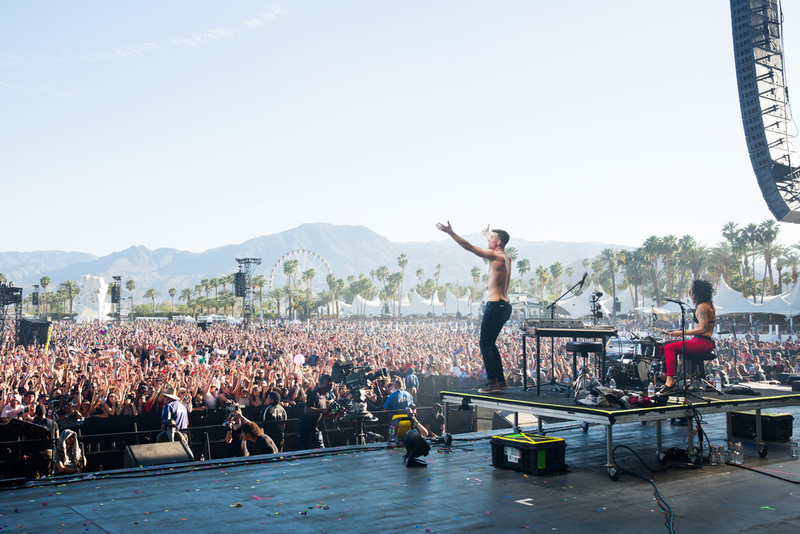 Matt and Kim perform on the Coachella Stage on Sunday. Attendees walk past the Coachella Ferris wheel at the festival entrance.